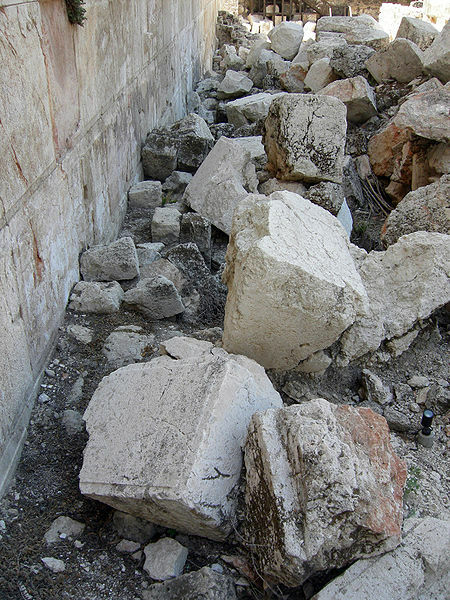 Excavated stones from the wall of the 2nd Temple in Jerusalem. One day the great buildings and structures of our life will fall. The very things that we often trust and rely upon to give identity, meaning, purpose, and security will crumble. This is not a prediction of the future or a forecast of doom and gloom. It is just a statement of reality. Life changes, loved ones die, institutions fail, people disappoint, relationships break up, bodies get sick. In those moments the great stones of our temples are all thrown down. Each of us is a temple builder. We build all sorts of temples: personas, families, beliefs and opinions, institutions, roles, reputations, accomplishments, dreams, and hopes. We build temples with the idea that they will contain and support our lives. The problem is not in building temples but in expecting them to do and be more than they can. Too often we confuse the structure for the content, the place of divinity for the Divine. Stone upon stone we build our temples with the expectations, sometimes spoken and sometimes unconscious, that these great structures will provide ultimate meaning, impenetrable security, permanent order, and unchanging direction for our life and world. The temple in today’s gospel is more than just a building in Jerusalem, more than a place of worship. It was the center and anchor of Jewish life. It provided identity, structure, and meaning just like our temples of today. The disciples are impressed. “Look, Teacher, what large stones and what large buildings!” They are, however, looking only on outward appearances. Jesus is not as impressed. This is his third and last visit to the temple. The first time, he went into the temple, “looked around at everything” (Mk. 11:11), and left. The second time he went in the temple he drove out the buyers and sellers, overturned the moneychangers’ tables, and left (Mk. 11:15-19). On his third visit Jesus was in conflict with the temple leaders (Mk. 11:27-12:40). He sat in opposition to the temple treasury while a poor widow “put in everything she had, all she had to live on” (Mk. 11:41-44). He leaves the temple for the last time and asks his disciples, “Do you see these great buildings? Not one stone will be left upon another; all will be thrown down” (Mk. 13:2). It’s not a threat or a forecast, just a statement of truth. One day it will happen. Regardless of how or when it comes about, the day our temple falls is the day our life and our world have forever been changed. It feels like the end of the world and as if all is lost. In that day earthquakes shake the foundations on which we stand. There is no stability. Famine leaves us empty and denies us any sense of satisfaction. Wars divide and fragment the unity of our life and relationships. Other voices tempt us with easy answers and shallow explanations. This is not so much about the end of the world as it is about the end of the many worlds, temples, and great buildings we have created for ourselves. When the great buildings begin to shake the temptation is to shore up the foundation, add some mortar, make it stronger, put it all back together. That’s not what Jesus says to do. Our spiritual work in those days is to not be alarmed or afraid, to be faithful and not be led astray, to be watchful, present, and attentive. It is a time for patient waiting. The day our temple falls is much more about revelation than destruction. With every true revelation there is always a falling away. It is the falling away of illusion. Fallen temples hold before us a truth and reality about our self, life, or world that we have denied, ignored, forgotten, or simply refused to see. It is always a painful process to see our great buildings fall and be confronted by the reality and truth revealed in that fall. Fallen temples confront us, forcing us to decide between reality and illusion, between life and death. They ask us hard questions about where we put our trust. The day our great buildings fall is the day we begin to face our corruptibility and impermanence so that we might know the incorruptibility and permanence of God. We face our temporal nature so that we might discover God’s eternal nature. Barrenness and emptiness precede the joys of the birth pangs. Fallen temples are not about loss and destruction but about birth and creation. Our God is the God of life not death, the God of creation not destruction. Every moment of every day new life is being created and given us. What temples of your life are falling or need to fall? What new truth or reality is being shown to you? How might God be creating and birthing new life in you? The above sermon is based on Mark 13:1-8. The readings and collect for the day, the Twenty-fifth Sunday after Pentecost, Proper 28B, may be found here. Thank you. I hope you all have a blessed and joyful Thanksgiving. Oh, yes! This is a hard truth; and one I know to be reality. Still, as you say, trying to shore up and rebuild is such a temptation! I know the times – yes, times, when the temples have fallen to be the times when I am drawn closer to Holy Reality – Holy Mystery. Thank you for the encouraging message, Mike. May you and Cyndi have a warm and loving Thanksgiving. Thank you Jan. I think the chaos of fallen temples, the seeming nothingness, is the beginning of a new creation. I hope you all have a wonderful Thanksgiving. Thank you Mike. I appreciate you reading and commenting on my blog. Were the twin towers of the World Trade Center one of our temples? Have we just returned to rebuild and shore up those foundations? Have we waited patiently? Jon Mark, I know you know this but you have asked the hard questions that push us to discover what lies in the depths of our heart. They are, I think, the right questions and often ones we would rather avoid. I do not intend by my post to suggest that God causes such events nor do I think that is what is at the core of your questions. Crumbling temples ask more questions than they answer. The challenge is not to answer them too quickly or facilely. If you build with God, your temple will resist because is built on stone. When you build without God, you can’t have a better result than the Tower of Babel. Yes, Cristian, I agree. Christ is the sure foundation. Next Next post: Thank You, O Lord!